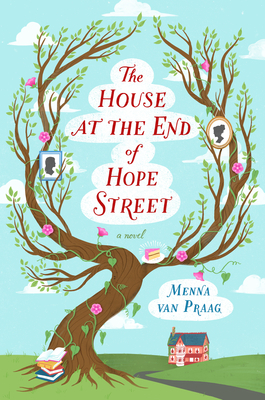 I am always a sucker for a Pamela Dorman book, so when the opportunity came my way to review THE HOUSE AT THE END OF HOPE STREET by Menna Van Praag, I jumped at the chance. Truth be told, THE HOUSE AT THE END OF HOPE STREET isn't exactly my normal reading fare. It's part fantasy and part magical realism which I usually steer clear of; however, it is a Pamela Dorman book so I figured it was worth a shot to read something outside of my comfort zone. THE HOUSE AT THE END OF HOPE STREET tells the story of a mysterious and magical house that has the ability to change its visitors lives. Take Alba, a young woman whose promising academic career has ended and she feels her entire life is spinning out of control. One day, she finds herself in front of "the house at the end of Hope Street" (a house that she never noticed before!) when an older woman named Peggy opens the door and welcomes her in. Peggy tells Alba that she can stay in the house for 99 nights until she gets her life straightened out. Peggy adds that, through the years, many woman have resided in the house and have had great luck in turning their lives around. Alba sees that she has no choice but to stay and figure out her next step; however, she quickly realizes that this is one very special and unique house. For instance, there are many photos of the female residents on the walls -- including some very famous women like Virginia Woolf, Daphne du Maurier, and Agatha Christie. These photographs actually come to life and provide advice to the residents of the house. As Alba spends more time with these "women," she begins to learn about her family and, more importantly, herself; and she begins the valuable process of healing. In addition to Alba and Peggy, there are two other women living in the house -- one is a struggling actress and the other has a mysterious secret. Like Alba, "the house at the end of Hope Street" offers these women a second chance and allows them to move forward in their lives as well. In addition, Peggy, the long-time caretaker of the house finds herself at a serious crossroads and wonders what (if anything) the next step will be for her. I found THE HOUSE AT THE END OF HOPE STREET to be absolutely delightful. The characters (and of course the house itself!) were very charming, and the overall messages in the story were uplifting and full of hope. I enjoyed the life lessons that Alba and the other women in the house discovered, but I also loved all of the advice that the past residents provided to the current ones. The entire story definitely had a sense of magic and wonder, and despite being a little different than what I normally read, I loved the feelings and ideas that the story evoked. As a reader who enjoys mysteries, I liked that there were quite a few mysteries and/or secrets in this novel. Everything definitely wasn't what it seemed in the house, but there were also some hidden events in the characters' pasts... as well as their futures. I appreciated how the author eventually came to reveal these surprises (some more shocking than others), and these unknowns certainly captured my attention and kept me turning the pages. Finally, I so enjoyed all of the cameos by the famous women who had stopped by "the house at the end of Hope Street" at some time in their lives. These women had the ability to speak to the current residents through their portraits that were hanging in rooms all over the house -- even the bathroom! Many of these women were writers or entertainers of some sort like Dorothy Parker and George Eliot, and their advice was genuine and appropriate given their life experiences. There were even a few women that weren't able to turn their lives around despite spending some time at the house. I especially appreciated that the author included brief bios of these famous women in the back of the book! THE HOUSE AT THE END OF HOPE STREET would make an extremely fun choice for a future book club meeting. Because these characters were all experiencing an assortment of hardships, there is much to discuss about their past actions and their future ones. There is a reading guide available with twelve great questions. Some of the topics that you might want to further discuss include the meanings of the colors that Alba "sees," the stigmas associated with mental illness, grief, secrets, redemption, forgiveness, second chances, sacrifice, self worth, and hope! Overall, I thought THE HOUSE AT THE END OF HOPE STREET was such a surprisingly sweet and heartwarming read. Recommended to fans of magical realism as well as women's fiction. Ahhhh! I MUST READ THIS!!! I'm not big into magical realism books but I think this one would charm me. Yes, like Sandy said! Plus, who couldn't use a magical house? And how about one that cleans itself?!!! I'm not into magical realism either but it really sounds like it works in this case. This sounds delightful! I usually hate magical realism but I do like fantasy. I hope to get to it soon. Magical realism is the pretty way to describe this book! I loved it and plan on reading up on the women that were previous visitors to the house as well.